The solutions proposed derive from an analyses of the existing problems expressed by the inhabitants, and tries to solve them within the existing conditions. The existing buildings are self-constructions, and the solutions proposed are designed by professionals. How could the dwellers make these proposals their own? Selecting among different options presented by the architects? Participating in their construction? This could be the next step in the process of transforming the existing conditions. 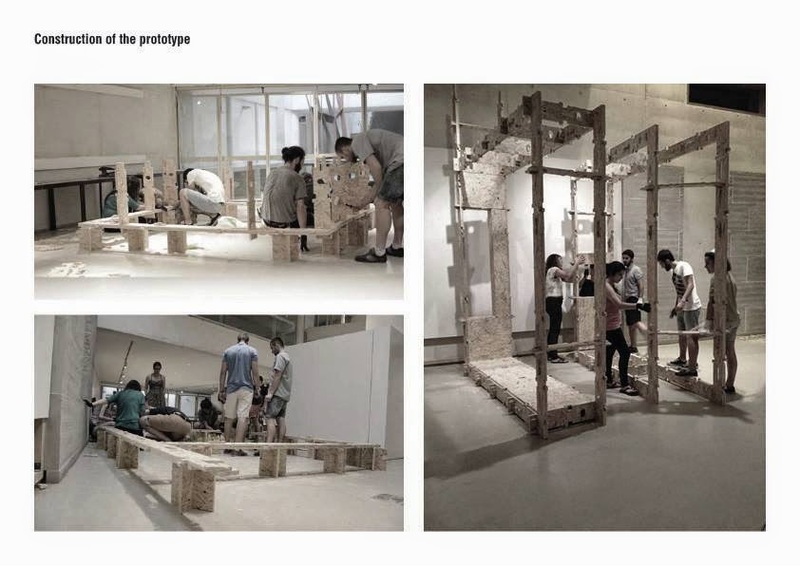 The team structures its proposal according to the relationship of each neighborhood to its shared open space in proximity to the street an approach that creates questions on the effects of this open space in relation to the dwellings. It is a holistic approach, they take advantage environmental issues using their intervention for cross ventilation in section. Interesting exploration of the intervention unit for space organization. The work of this group represents a very good solution in complicated conditions of this site. They made a detailed anylysis of selected site that has very complicated urban plannig conditions. In its proposal demonstrate wide range of designs which contribute to the improvment of the living environment. The positive feature of this work is applying of psychological aspects in their design by creating spaces for the privacy. Many examples enrich their work and prove ability to make an interesting design in relatively short time. Very complex and distinctive work of this group started with the consistent analyses of the small neighbourhood in Bairro, with the questioning the needs and wants of inhabitants,. Results are very effective and positively influence living standards and social interactions of this small habitat. It is good the way this group worked from the very public realm down to the detail of the private spaces. A very thorough analysis and set of interventions. A few simple strategic moves have enhanced the public or semi-public patio space. The FABLAB modular system is used in a very systematic way in both the external patio and to create and/or modify existing living spaces within existing enclosures. Some queries - How is weathering of the OSB dealt with where it is exposed? Also how is the step in the module dealt with, although to be fair this is a query for all the groups? It is remarkable the effort of the different groups working in Liberdade's site to create proposals that improve the inhuman conditions of the visited dwellings, by designing new 'objects' to place on the units or courtyards. But some questions arise: How much can design' do in this kind of situation? What is the area of influence of architecture? It is not that only when the architects work in collaboration with other social and economic agents than his results can be meaningful?